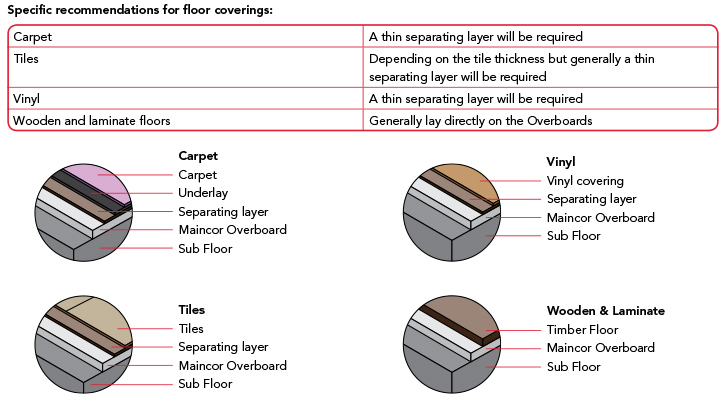 Overboard dry screed panels are suitable to accommodate a wide variety of floor coverings, including carpets, tiles, wooden and laminate flooring. Floor coverings should not be installed until 24 hours after the installation of the system. A thin separating layer is recommended; typically either a 6mm plywood, a 6mm cement-based tile backer board, or a decoupling membrane where tiles are used. Consideration should be given to the amount of point loading expected on the floor. For wet areas, fully tank the entire surface of the boards to protect against damage. As with all underfloor heating systems, to achieve optimum performance it is reccomended that if using carpet and an appropriate underlay, the combined resistance of the two should not exceed 0.15m²K/W which is equal to a TOG value of 1.5. When selecting your floor finish, it is recommended that you check with the manufacturer to ensure that it is suitable for use with underfloor heating. Consideration should also be given to any adhesives that are to be used, as some will limit the floor surface temperature that can be achieved. NB 1 Tog = Thermal resistance 0.1m2 K/W. Always refer to the floor covering manufacturer’s instructions.